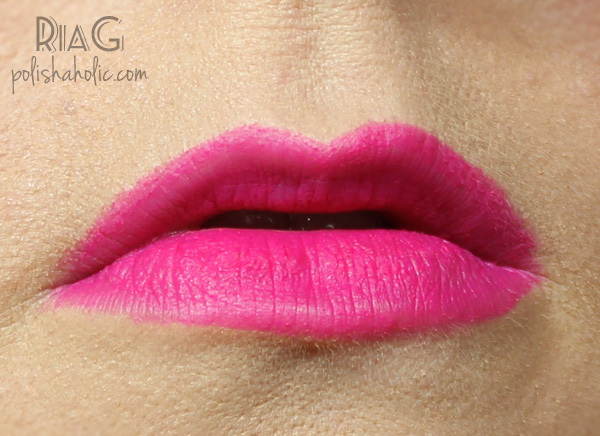 Days are getting brighter and spring is getting closer day by day so it’s time to dig out those bright lipsticks. 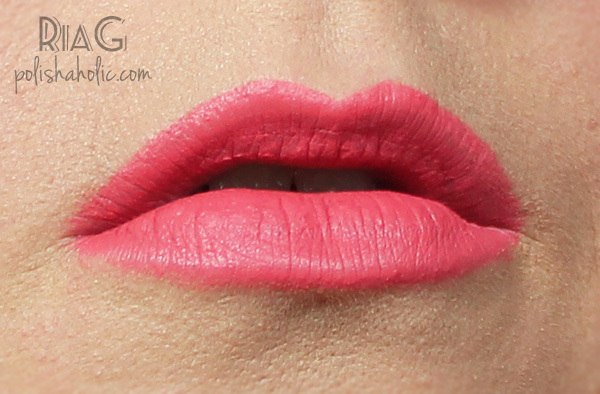 Illamasqua Eurydice and Scandal are my favorite matte lipsticks for this time of the year. These are very dry, very very pigmented and they stay on really well. Dryness can be an issue when you apply the lipstick since these are a little dragging on your lips. I find my MAC Ruby Woo being the same way. I use a brush to apply these and I really have no problems. Despite of being dry they don’t feel crazy dry on your lips, more like creamy and as said, the staying power is really good. Eurydice is a super bright pink and I find that this can stain your lips a little. Not much though and I don’t find it annoying. My lips are naturally pretty light colored so this little staining effect gives them a healthy glow :D Just wanted to mention the possibility of staining since some of you might not like it. Scandal is a warm coral pink and I absolutely love this shade. It’s so perfect for me! I haven’t noticed any staining while using this one. 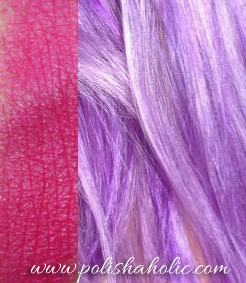 Both of these are bright and super fun colors that light up your whole makeup look and get you in a right mood for spring! ***Eurydice and Scandal were purchased by me. 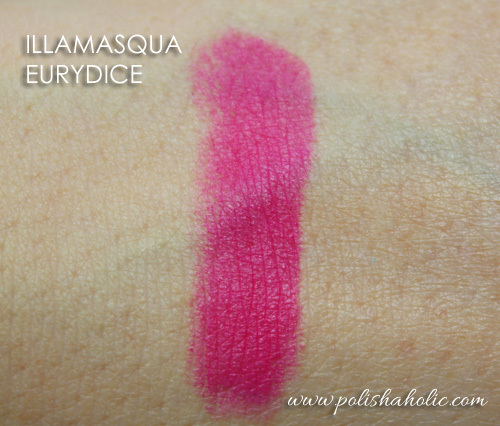 This is Illamasqua Eurydice, a matt finish bright pink/fuchsia lipstick. This is quite dry but still applies well. My lips weren’t moisturized enough for this and you can see some dry spots. So using a good lip scrub and a moisturizer is a must with this one (like with most matte lipsticks). This wears well and doesn’t feel too dry on my lips. 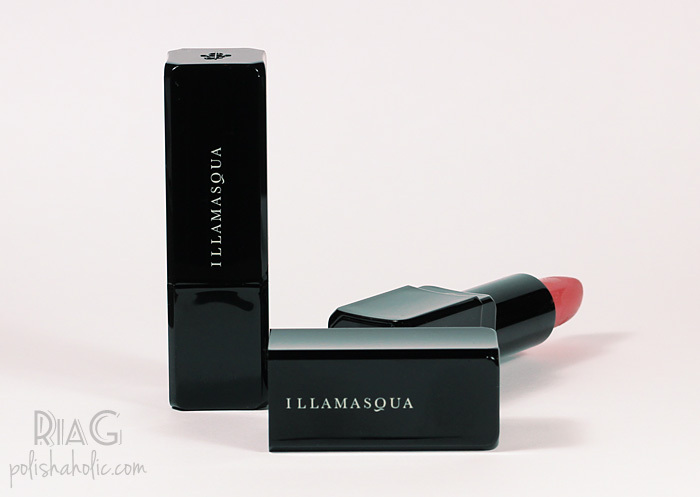 I have two Illamasqua matt finish lipsticks and I love them both, long lasting and great quality. When I bought this my hair was blonde and I felt like this might be too bright for me. 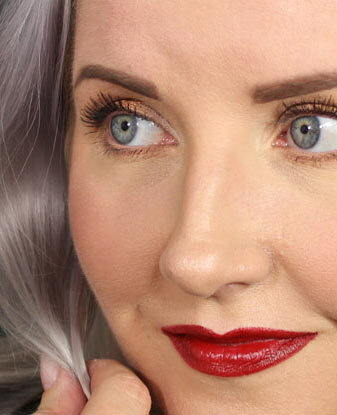 Now that my hair is purple my usual go-to coral and peachy colors don’t work as well but this one fits me perfectly (full makeup pic using this coming up in near future). Not really a fall color but when there’s some snow on the ground this will look gorgeous! ***Eurydice was purchased by me. I don’t benefit from clicking the link on this post. Here we go again with another untried. This time it’s Illamasqua Load. If you can get past the image the name and color can create ;) this one is actually quite lovely. Very unique color in my collection and makes a great base for layering glitter or nail art. This is three coats with G & G HK Girl top coat. Here’s the amazing Illamasqua Rampage!! Dark green creme polish that is clearly green inside too and doesn’t look black anywhere. This one cost me some serious money with shipping but I don’t mind paying for a great quality such as this. I’ve been wanting a green creme like this for a while now and I finally got it. Other bloggers have been going crazy over this and for a good reason. Green perfection in a beautiful bottle! Rampage is thin in the bottle and applies really well. Two coats was enough for opaque result on my short nails. This one also dries pretty quickly. In this mani I used: OPI NNS x1, Rampage x2 ja päällä Seche Vite. I had to change my photograph hand cos all the nails on my left hand are different lenght and it just looks down right ugly. The right hand isn’t all that cute either at the moment but I gotta take pics of something ;) I just hope I can get my long nails back someday without using acrylic to get the lenght. This was my first Illamasqua order and based on that experience I can recommend their online store. Service was good and quick and the shipping time from UK to Finland was less than a week. I love the quality of this nail polish and I’m going to order more shades soon. 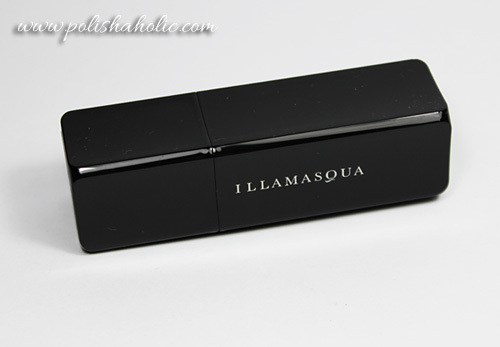 Illamasqua also sells other cosmetics products on their online store. Stamping Eyeshadow Wet n Wild Subscription box Rhinestones A England Glitter Gal Pure Color 10 Dance Legend Blush Urban Decay Cuticles Gradient Dollish Polish Delush Polish Lipstick Jindie Nails China Glaze Base coat Acrylic paint Lookfantastic Beauty Box Born Pretty Store MAC F.U.N. Lacquer KIKO Polishers Inc. Mavala Bliss Kiss Oumaxi Studs Color Club Illamasqua Essie Nail growing O.P.I.